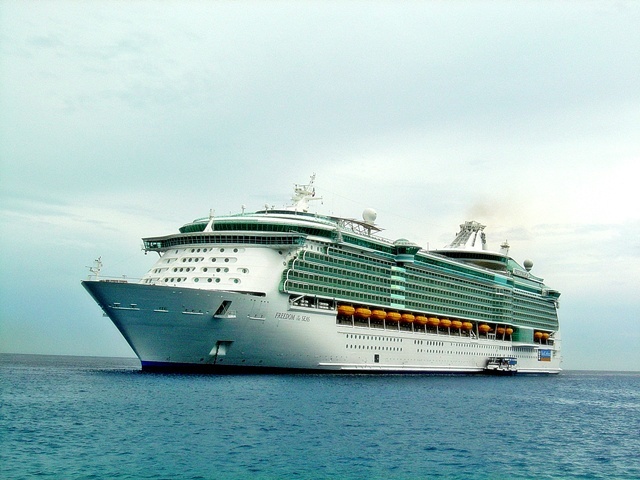 This was the first of the 3 Freedom Class ships, Freedom of the Seas, and she's spectacular! We did this cruise during our wedding anniversary week with our great friends and cruise buddies, Kim and Steve. Embarkation was somewhat sloppy due to bad weather and a bunch of non-passengers attending a meeting aboard as "Day-Passes" ... but once aboard, everything was as smooth as could be. 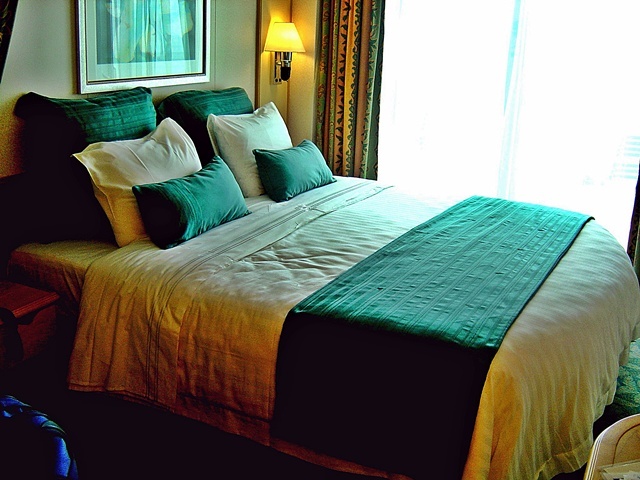 We began this cruise exactly to the day and from the same port and with most of the same ports-of-call as our very first cruise twelve years ago aboard the Carnival Holiday. 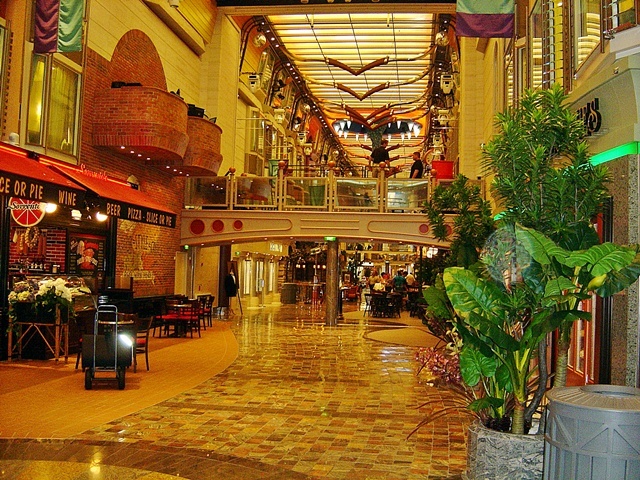 Things sure have changed tremendously in the cruise industry since 1994. Back then, Holiday was considered fair sized at 46k tons and 70k ton ships were just being announced. 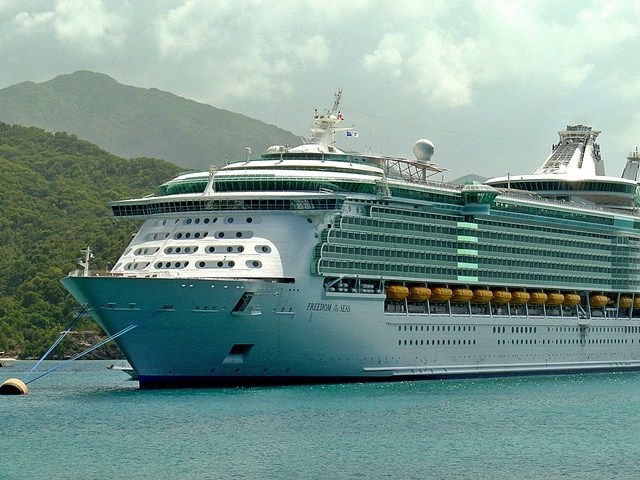 Freedom of the Seas is 160k tons... or about 4 times more massive then the comparatively tiny Carnival Holiday. You can surf on the Flowrider surfing simulator... or you can sit in a hot tub (one of two!) that's cantilevered out from the sides of the ship affording views straight down some 11 decks to the open sea... or you can play in the huge waterpark called the H2O zone... or you can climb the fleet's tallest rock wall! 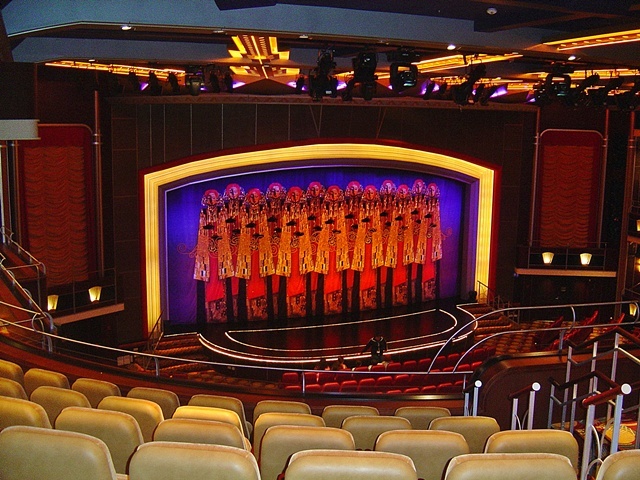 There's even a boxing ring (in case you want to fight someone on a cruise?) in the gym! Of course, there's also all of the signature Voyager class stuff to do and see: the Royal Promenade (longer then any other with more shopping, a barber shop and Sorrento's Pizza to name a few)... the ice skating rink... the alternative dining venues of Portofino's and Chops Grille... the Windjammer Buffett... miniature golf... basketball... internet surfing (throughout the ship wirelessly, no less- but for a fee)... discos, bars, casino... the whole enchilada! It's all there and even more. As I said, Navigator but bigger! Rockwall... climbing almost to the top of the smokestacks! Getting out there ("Get Out There" is the official slogan of RCCL) and moving about the ship was pretty easy. There was the occasional wait for elevators depending on traffic about the ship, but for a ship with 3600 passengers, it sure didn't seem like there were that many people aboard (except during embarkation and debarkation). 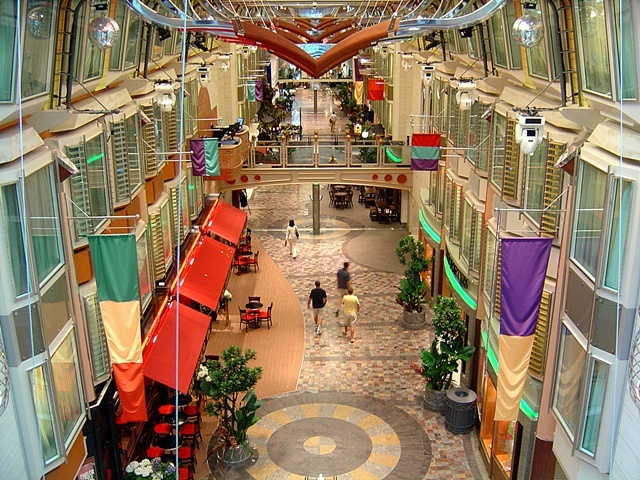 The Royal Promenade is heady with aromas of food from one end to the other- especially when passing "Ben & Jerry's" Ice Cream Parlor where the smell of baking waffle cones is mesmerizing. 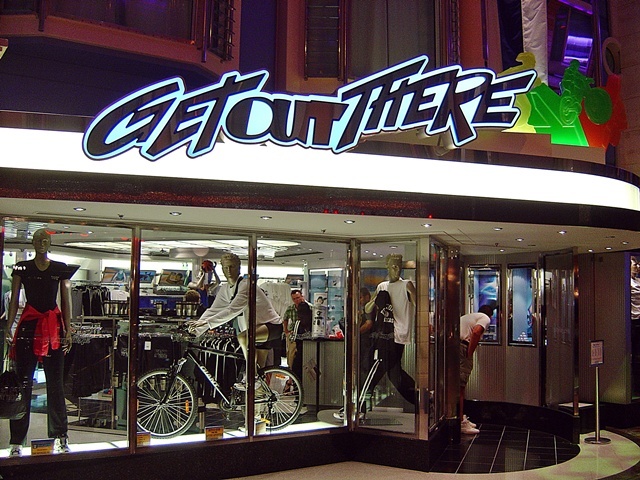 Get Out There store... cool clothes! Our itinerary was the typical western Caribbean stops that we've been to on many cruises, but we still managed to have fun in them all! Our first day out from Miami was a day at sea to take us from Miami to Cozumel. It was a gorgeous day that we spent in the Sun on the upper main pool deck (deck 12) near the starboard external hot tub's upper dome. 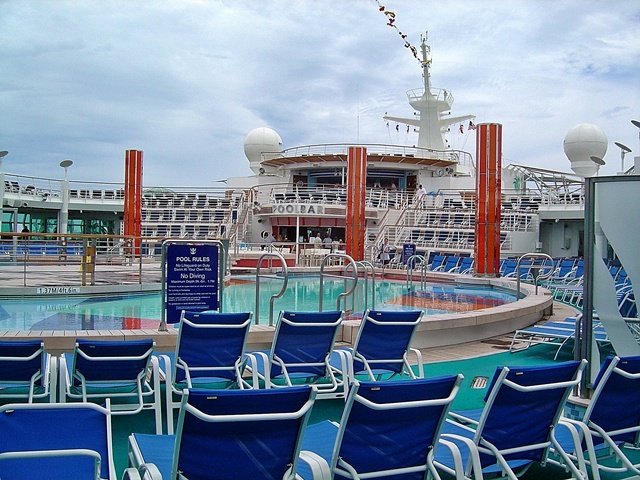 There were plenty of seats available in these areas as people tended to gather closer to the pools down on deck 11. 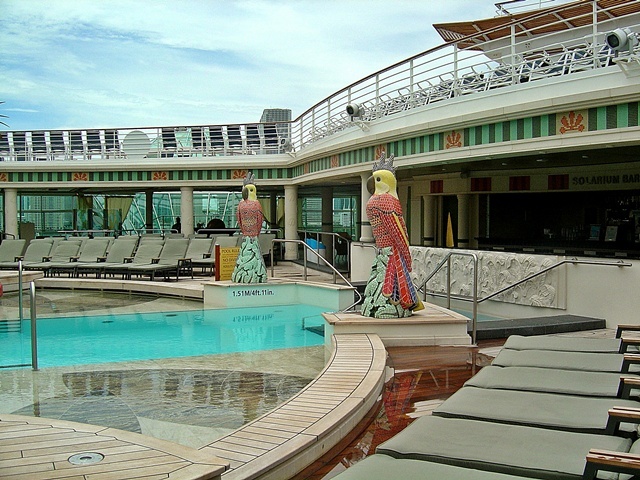 We were ideally located for the main pool's deck 12 bar. At Cozumel, we were forced to cancel our planned excursion to Passion Island due to thunder storms and drizzles and clouds that persisted until about 1pm. Although the cruise lines are always reluctant to refund excursion tickets, there was no arguing on their part with the fact that sitting out on a beach during a thunderstorm was not something we wanted. So, after some discussion of this with the Excursions desk, I got all four of us our refunds. Kim and Steve and Diane and I shopped around in the town where the water shuttles dropped us off. (Freedom's too big to dock here) This is one port where I would not recommend buying liquor in bottles. We purchased a small bottle of Bacardi Rum here and found out it contained some watered down, nasty swill inside instead. At Grand Cayman the next day, we all took a Taxi to the Courtyard Marriott's choice segment of Seven Mile Beach where we rented chairs and grabbed sodas... a gorgeous spot and one I'll return to again. The cab fair over was about $5/person... not bad at all. The day was absolutely beautiful. 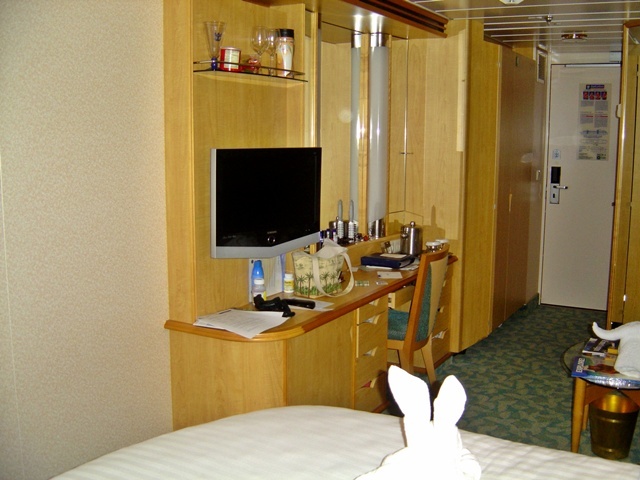 Another view of our cabin... that's a towel bunny on the bed. At Jamaica the next day, the girls went horseback riding while Steve and I did Canopy Jungle flying zipline tour. 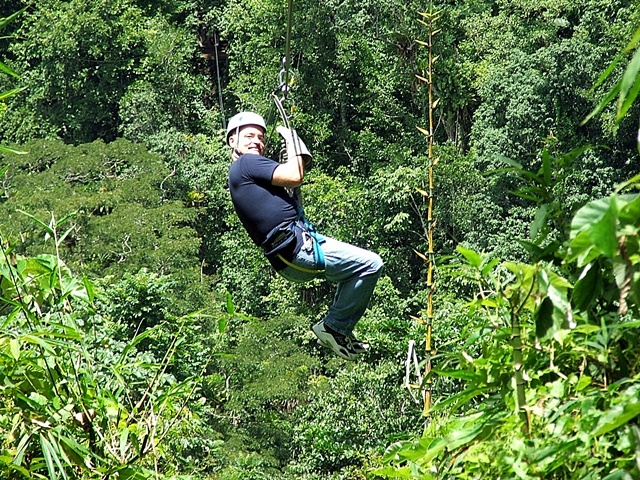 Basically you're hooked up to two cables and you fly about 100' above the jungle floor! This was one of the coolest things I've ever done in my life. If you're relatively fit, I highly recommend it! Jamaica was the only stop where the ship was actually able to dock. The day was sunny and wonderful. 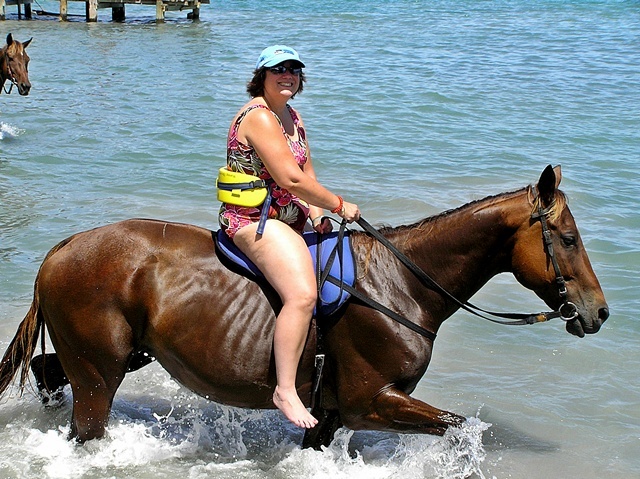 Diane attempts to ride a horse back to the Freedom of the Seas! 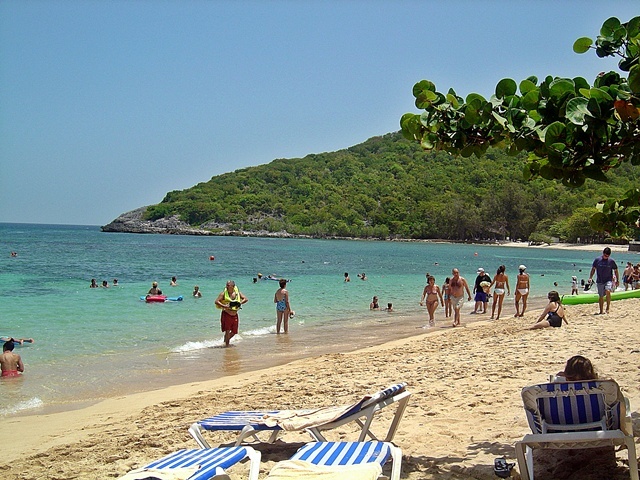 Our last island stop was at RCCL's private section of Haiti called Labadee. There are several beaches within walking distance, and RCCL sets up BBQ lunches all around. It's a spectacular stop now... far more so then it was when we were there on the Grandeur cruise back in 2000. I'm actually going to look forward to any cruise making a stop here in the future! Again, the day was sunny and hot! Our final day, another day at sea, was spent sitting around in lounge chairs watching the ocean drift by... peaceful and relaxing as Kim said. 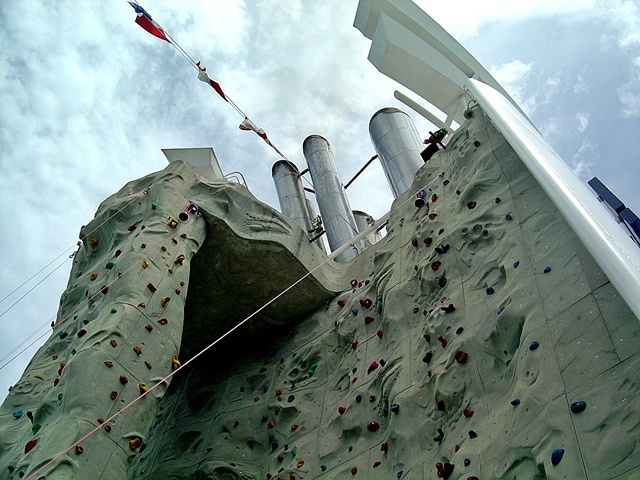 I never did climb that rock wall or try the flow rider. Obviously, another trip aboard Freedom (or her sisters) will be a must! 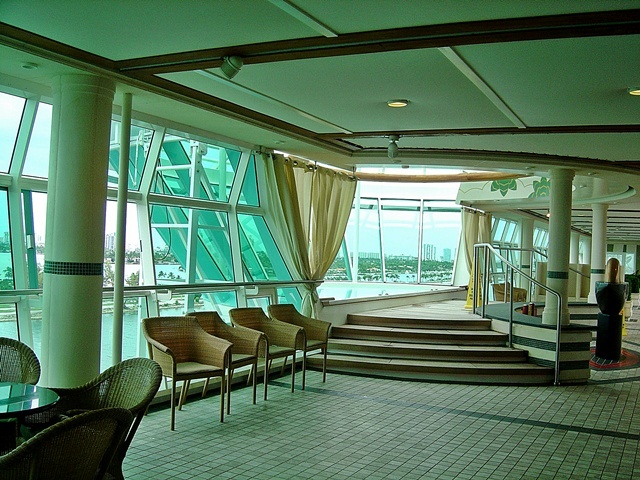 Adults only Solarium... always a favorite spot on any ship! Our cabin steward, Cesil was wonderful. She always had our cabin cleaned up and spotless in record time and she never got in our way. She was a pleasure. Our waiter, Wan, was somewhat harried, but he always made great recommendations for our meals... and the assistant waiter, Julius, always got me my diet Cokes. I was very happy with my service overall. We had a lot of fun with the waiter team in Chops... in fact, they thanked me in particular for giving them all a bunch of laughs with my running commentary. One said she hadn't laughed so hard in so long... it made me feel good to cheer up people that work so hard for our cruising pleasure. Our waitress in Portofino's was very sweet, but I got the impression she didn't want us to leave. 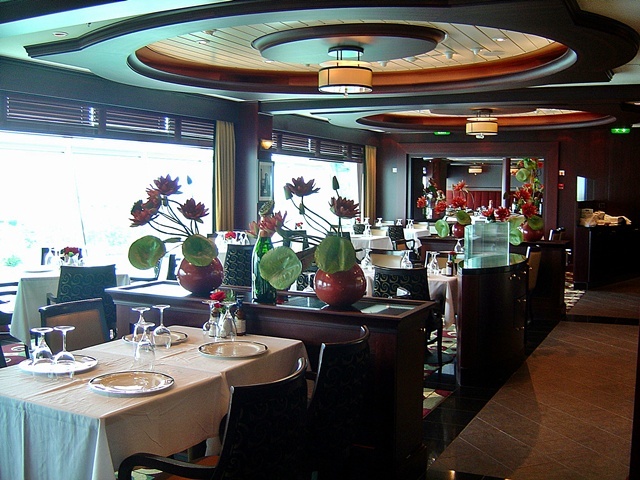 Sometimes I think they are trained to make the dining experience a lengthy one at Portofino's. The team at Johnny Rockets put on a more-enthusiastic-then-usual show for everyone (which made up for the typically so-so food in all Johnny Rockets restaurants) on the afternoon that we ate there and one passenger got up and started dancing with the waiters in their typical routines between serving. This isn't that uncommon except for the fact that he didn't seem to want to sit down... so they just kept the dance music going. For all I know, the old guy's still twisting up there at JR's. 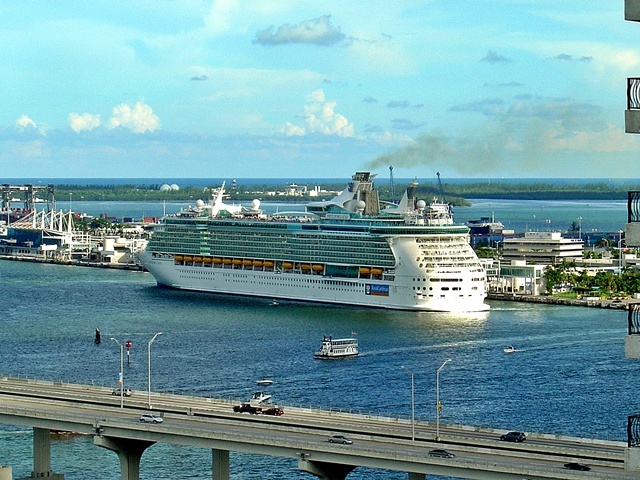 Disembarkation was very easy (except for the fact that I didn't want to leave) and in a short time I was back at the Biscayne Bay Marriott looking back wistfully at the wonderful Freedom of the Seas loading her next group of passengers. It was fun though to see her departing (something you never want to see when you're on your cruise week! ), sailing majestically out to sea. I can't wait to cruise her again someday! All photography on this page done by Paul and Diane McCullough except where noted.